The Theme is built on top of the fabulous woocommerce shop plugin It comes with a plethora of options so you can modify layout, styling, colors and fonts directly from within the backend. 5 Slideshows, 16 predefined skins (which are easy to modify from your backend), font and color options as well as dynamic template builder will help you create the Website you need in no time. Important content is always placed before unimportent in your source code (eg: Blog Post content before Sidebar), Headlines are wrapped in heading tags (h1, h2, h3 etc) to signalise their importance to search engines. The site also uses heavy internal site linking, which is also of vital for search engines (related posts, breadcrumb navigation, primary and secondary navigation menus, footer navigation) With this WordPress Template you are well equipped to get a high google ranking and attract visitors to sell them your fabulous products . AviaCordion Slider: A self built jQuery Accordionslider that works with any number of images starting from 2. The slider does support Images as well as videos, opened in either a lightbox or directly embedded. Piecemaker2: A sleek and modern 3D Slider that can be configured directly from your WordPress backend. Any number of images and transitions possible. Caption Slider: A slider that emphasizes the Image caption and allows to add Buttons that not only link to any other page but also do work as slidecontrolls, so your user gets a 1-2-3 Step experience. You can also use choose between16 predefined default skin and with the help of color selectors for links, background image and color create a unique layout in a matter of seconds. The Theme comes with a lot of pre built layouts for almost everything you can imagine: 3 different default Blog layouts (small, medium and big preview image) which can either be displayed with left or right sidebars, or even dual sidebar layouts. This default option can be overwritten for each post individually so you always can select the layout fitting best to your entry. Same goes for pages: sidebar left, right and medium options as well as no sidebar at all. Build templates in a matter of seconds with a drag and drop interface that allows for almost any combination of posts and page content possible. Want to build a 2 column page without slidehsow? easy. As mentioned above you can set a default sidebar alignement for posts and pages, and also overwrite this alignement for each single post and page. you can choose to display a left, a right or both a left & right sidebar. You can add custom widget areas for specific pages that will only appear on those pages then. This means the layout will still be functional (dropdown menus for example) and the content accessible. The theme supports all major new browsers (firefox3,4,5,6+, IE7,IE8, IE9+, Safari, Opera Chrome) For older browsers (namely the forsaken IE7) not all options are available and will displayed pixel perfect but as always the content will be fully accessible to your users so you dont lose any visitors due to their inability to read your content . Transform your WordPress website into a thorough-bred online store with the woocommerce shop plugin. The plugin makes it possible to build pretty much any kind of shop you want. Various products types (normal, variable, downloadable etc), different payment gateways, a flexible category and attribute system, sales reports and a super easy to use one page checkout are just a few of the features of this awesome free plugin. 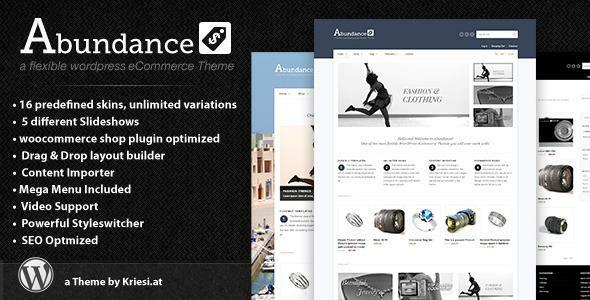 Share the post "Abundance eCommerce"